We know that deprecation policies can be complex. 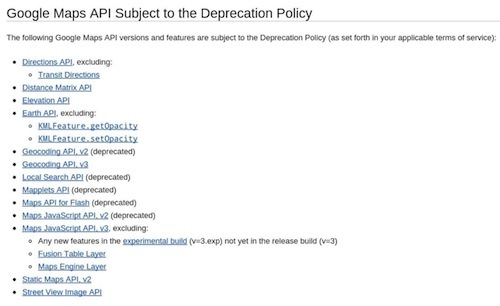 But it shouldn’t be hard for you to determine which features of our APIs and services are covered by a deprecation policy and which ones aren’t. To date, we’ve often used the label “Experimental” to indicate that certain new versions, features, or functionality don’t have the deprecation policy. But we know you don’t want to hunt through documentation looking for what is “Experimental” and what isn’t. We are not adding or subtracting anything, but only changing how we display this information to make it easier to locate and understand. This change will be fully rolled out in the coming weeks. Please refer to each API or service’s terms of service for more information. We hope this will make your life easier so you get back to your code sooner! Adam Feldman is a Product Manager, focusing on all of Google's APIs and making sure Google provides the best possible platform to developers.